Stylish Design and Slim Form Factor: The iPad Wall Bracket is designed to match the look and feel of the iPad. The thick aluminum / MS front panel features a high quality finish look and feel and is available in gloss or matte black, white and silver. The iPad Wall Bracket is only 15 mm thick to retain the iPad's slim form factor. Hidden or Exposed Home Button Versions: Choose the option better suited for your needs - hidden home button, to prevent users from accessing applications other than the one you select to run, or exposed home button, providing users access to any application while retaining the iPad security. Compatible with all iPad versions: (1 - 4, Air 1-2) and iPad Mini (1 - 3) Our iPad2, 3 and 4 Compatibility Kit adds additional padding to perfectly fit the slimmer iPad 2, 3 and 4 versions. iPad Air compatibility kit fit the iPad Air 1 and 2 perfectly. Make sure to add the needed kit to your order. Desk Stand / Angled Wall Attachment: Our desk stand /Angled Wall attachment, in conjunction with the wall mounting bracket, securely attach the iPad to a desk, counter or a wall, at an easy to use 45 degree angle, in a horizontal or vertical orientation. Keep your iPad Charged: Keep your iPad charged with the standard iPad power cable. The iPad Wall Bracket is designed to enable a fully concealed power/charging cord installation. The power cable runs from the back of the bracket directly to the wall. 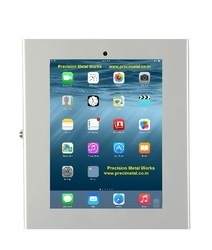 Looking for Wall Mount Tablet Kiosk IPAD ?